4010 Sindarin Names Added to the Database! I’m so close to finishing the transfer of the Sindarin names to the database! Only a few hundred left!!! 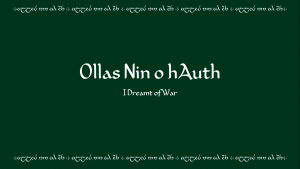 Adramir a Athramir – Song I Helped Translate is Released! Back in 2015 I got a translation request for a song translation into Sindarin. This song has been recorded and now have a video up on You Tube! Check it out! On the Sindarin Pronunciation page, I’ve added recordings to help people learn how to pronounce Sindarin words. If people love this addition, I’ll add the same feature to the other pronunciation guide pages.